Second reminder that I'm away next weekend at Le Guess Who (watching, by my estimation, at least three previously #LC-picked artists, yay! ), so if anyone feels able to help out here, please take a step forward and let me know on the tweets, ok? 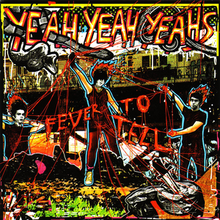 Last week we broke from regular tradition and pocketed a corporate shilling from The Yeah Yeah Yeahs, spinning their 2003 debut "Fever To Tell" to celebrate it's re-issue, which went down rather well indeed, not surprisingly. And the corporate shilling raffle, in the form of a vinyl test pressing of that very re-issue, was won by @emmaprice! Congratulations to her, and thanks to all for participating. It's my first time in the chair, and I'm honored to be here. It's a good thing I had two weeks to think on what to play you guys, because I had loads of ideas but none of them seemed right somehow. Finally I stumbled upon a song that has been a come-and-go favorite of mine, and remembered that I have the album with that song somewhere and that I indeed saw it when I last moved. Finding the album was an adventure all of it's own, the details of which I shall not bore you with. Eventually, (blessed be my two weeks) I had it in my grubby mitts. After finding the album I also found out it lasts about 80 minutes when listened in one go, but luckily it is comprised of three parts. We shall be listening to only parts 1 and 2 today, but if it catches your fancy you can always take a gander at part 3 after we're done. Now, the British group behind this piece titles it's style as "trip hop progressive alternative", which is a bit of a mouthful. All these terms are worth keeping in mind when listening tonight, though, because the album treats that phrase like an accordion: squeezing and pulling it into different directions, having more trip and less alternative this moment, and almost fully just hop the next. It's a ride - not that wild maybe, but well worth sitting out.